... and my first thought was "Hey, those would be great frames for photos of Carlotta and Christine as Elissa in Hannibal!"? Appliques for the Triangle Girl bodice! I picked them up when Kaedra was in town and we went fabric shopping. I'm still deciding which one of the two multicolored appliqués should be the centerpiece. The color on the star one is a little bolder, but the bottom one has such a cool design going on. Oh, I agree. The bottom one has such a gorgeous design. You could of course add some colourful "gems" to it? Very nice appliqués overall, wish I could have joined you gals for a shopping spree. Ooh, that's definitely an idea I didn't consider! I've been dying to have an excuse to some really awesome gems from a trim store I love. But I really want to find a nice blue fabric for the base first and for some reason, I can't figure out what kind of fabric it is. I wanna say taffeta, but that doesn't sound right. I'm mostly basing it off the Vegas version with the exception of the appliqué arrangement, which always seemed a little haphazard to me. So yeah, I *like* black that's in most versions but something about that super vibrant shade of blue really speaks to me. I wish we could have met up when you were in NY! I would have dragged you to the garment district with me. Viscountess wrote: Ooh, that's definitely an idea I didn't consider! I've been dying to have an excuse to some really awesome gems from a trim store I love. But I really want to find a nice blue fabric for the base first and for some reason, I can't figure out what kind of fabric it is. I wanna say taffeta, but that doesn't sound right. I dragged myself there, but it would have been SO much fun going there with a fellow costume maker. I've had some shopping sprees with Josefine, and I've found some awesome finds with her. For example the salmon silk for the Aminta costume. I think shopping with other means I see the fabric shops with new eyes, or get new ideas. As for the Vegas version of the Triton girl, it really is one of the prettiest ones out there. Lovely materials and snug fit. I wonder if the bodice is made of some sort of lurex brocade or damask? There are times the blue area appears metallic. Can't tell for the dark dots, they might be as well. 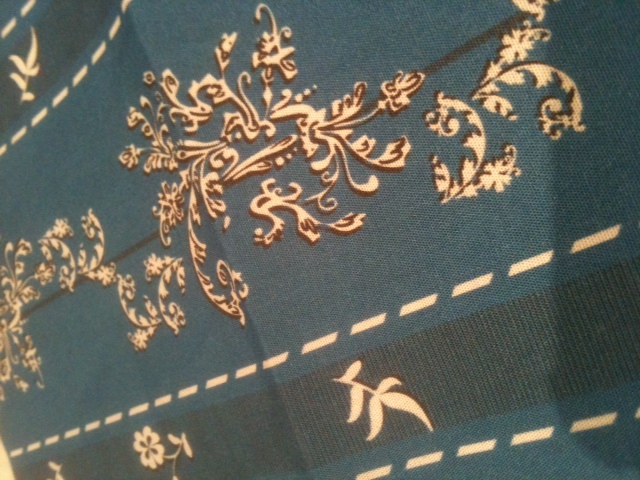 Maybe something like this vintage 1960s dress fabric, except dark (navy? black?) on turquoise rather than blue on blue? phantomfett wrote: So, I started preparing my Red Death costume for some major updates recently. The sleeves need the most work, so I dismantled them. I am left with a pile of 192 pieces of piping, 48 velvet panels, 48 canvas panels, and 48 pieces of boning. *sigh...* Now, I have to modify the patterns so I can change the shapes of all the panels, then re-attach all that stuff back together. Plus, I still don't know if the 56 pieces of gold trim on the crushed velvet panels will need to be moved or not. Once that is worked out, I still get to attach 280 smaller pieces of trim. Oh boy! Let it begin! LET IT BEGIN!!!! No-once can accuse you of not being patient! A couple of the World Tour costumes on display in either Taiwan or Shanghai. The Wishing dress was worn by Ana Marina, that's all I know. The link also has the Phantom's cloak, and the "Frilly lady" Masquerade costume. Dear God, noooo. Seems like the golden "jellyfish" appliqués from the RAH concert is here to stay. 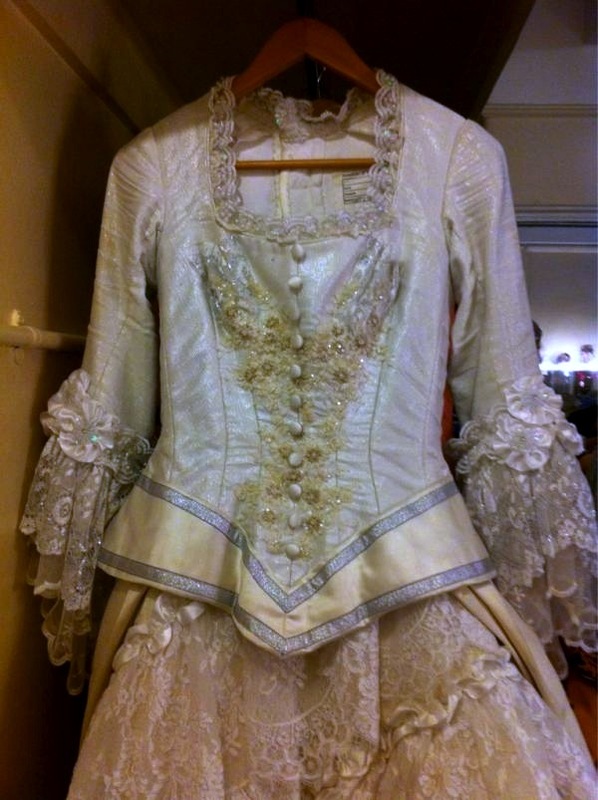 Sofia Escobar twittered a picture of her Phantom wedding dress. It has even more of them. Had they at least been placed higher up, around the neck opening and a bit down, I could have tried to understand the aesthetic thought behind them. Now it looks like she spilled coffee on her costume. That's exactly what it is! Four hours of pointing at a fabric/applique/trim and going "Aminta." "DON JUAN CLOAK" "WEDDING GOWN LACE" "CROTCH TIARA!" I think you're right, it's a fabric that I'll know when I see it, but sometimes I get lazy and want to go "Brocades?" to the salesperson when I walk into a store. Viscountess wrote: That's exactly what it is! Four hours of pointing at a fabric/applique/trim and going "Aminta." "DON JUAN CLOAK" "WEDDING GOWN LACE" "CROTCH TIARA!" I can't wait to start but I still need to finish my 2004 Think of Me DressO_O Please help me! I have so many things to do and I miss time! I also need to make a Regency Dress, a Victorian original dress, another original crinoline... Shame on me. I think Phtanom too much! Can there ever be too much Phantom? Haha, I guess there can. But sorry to hear about the swatches. Waiting for stuff can be sooo tedious. Glad you got your TV patterns to play with in the mean time. You could make a mockup of cheap cotton, to get a good fit? This is what I'm planning to do but I have to make the regency dress and a spencer before starting this project (and I have to make the bustle too...). And I'll have to separate velvet and coton pieces, which means, cutting the piece in 2 parts... OMG so much work on these 2 front pieces! I hope I have someday the blue and PONR gown. I want it sooo! operafantomet wrote: Dear God, noooo. Seems like the golden "jellyfish" appliqués from the RAH concert is here to stay. Sofia Escobar twittered a picture of her Phantom wedding dress. It has even more of them. Had they at least been placed higher up, around the neck opening and a bit down, I could have tried to understand the aesthetic thought behind them. Now it looks like she spilled coffee on her costume. Oh yes, oh no! You are right, what do they with the dressings? GUYS! A DREAM COMES TRUE! I've received my test swatches yesterday and... They are perfect! As a graphist/illustrator I'm quite stressed with color that appears correctly on my scrren and which has to be printed. You can have surprises sometimes but... all the colors are perfect! I used the first cotton and the first poplin available (16 and 20$ per yard which isn't very expensive for a perfect fabric!) and well.. the cotton (16$) is better than the poplin. The print is perfect, I washed it and the color is still here, the water wasn't even blue even I the fabric is a deep blue one.. I've pulled on the fabric strongly and there are no cracks... It's a fabric you could find in a fabric shop, it's absolutly professional! Well... I CAN'T WAIT TO START THIS DRESS! Some of the pics have been taken yesterday with a bad light... So you just have to imagine that the result is even better! Now I've got a BIG problem.. Which color should I choose?! Melly, that IS perfect!!! I'm forwarding all potential Wishing dress makers to your post, pronto! 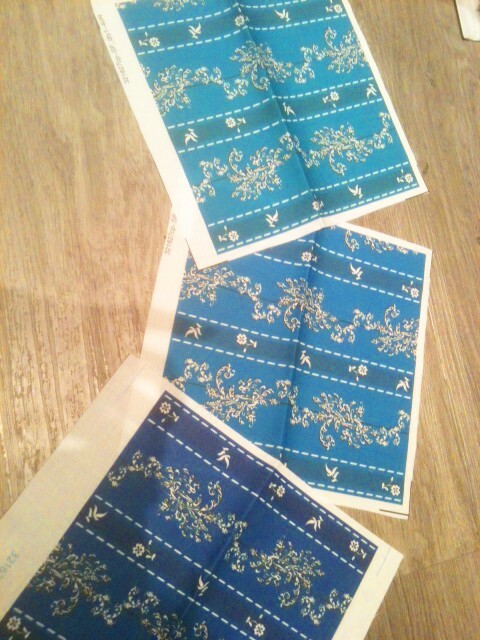 As for colour, the middle or lower one (in that first picture of all three). I'm leaning towards the middle on, as it's closer to how the original fabric is in real life, but the lower fabric is how it often appears on stage. So one of those. Don't hesistate to share, and as it's possible to update the original file, Phans can still tell me if something can be improved! I highly recommand you to purchase a swatch first (fat quarter 21"x18") just to be sure that the repetition and the size will be ok. It won't be lost as it's big enough to cut a piece inside the swatch). - The cheapest fabric is the coton Kona one. It's soft and is good enough to make a lined historical/correct costume. But the print render is not as good as the poplin's print but it's a detail, it's still very good. The poplin looks stronger but really thin... I think is not as good to wear as the first cotton. The coton is softer. As they try to finish some of their rolls, they ask you if you authorize them to cut your fabric, and where. As you can see it's a very detailed service Frenchy fabric makers, take a lesson! This is amazing! I've almost had the Wishing gown made several times over the years and now I'm so glad that I waited. I'm going to order the swatches tonight. Thanks so much for all of the hard work you put into this! That's such a great dress from the Sylvan Glade costume. So cute! "Phantom unfolds in two worlds: the glittering, public showcase of the Paris Opera, and the secluded underground where the Phantom writes his opera and nurses his rage. Thematically, too, the musical is a web of opposites: goodness and evil, beauty and deformity, innocence and guilt, life and death." Thematically the "Janus" face of the Phantom fits into this. A vertical half mask was designed instead of the horizontal half mask, so Michael Crawford had some possibility of facial expressions. 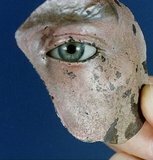 Originally it was designed for the left side of the face (the left side was traditionally considered the "bad" side in Christianity). But by the time the mask design was finished, Crawford had already worked on a lot of the blocking in his head, and was clear on one thing: the mask had to be on the right side of the face. This is why the mask is on the left side in the design, but on the right side on stage. What inspired the mask, though? I've heard many different explanations. Some say it's inspired by Venetian carnival masks. The deliberate porcelain look of the mask can indicate some truth to this. Bjørnson is said to have studied old Venice for the boat scene, so their mask tradition might have influenced her as well. Maria Björnson (Production Designer) fashioned the Phantom’s mask after half-masks worn by disfigured soldiers in World War I, often with a detailed eye painted on to “replace” the lost one. 1. Jack Huston from the TV series Broadwalk Empire. 2. An extant mask from 1918, in the Gilles Archives at Queen Mary Hospital in the UK. "We were agonizing over how the Phantom's mask should look. I reminded her of a hat she had once worn to a fancy dress ball at the Lloyd Webber's house. It covered one half of her face and only one eye and crescendoed on top of her head with a long feather. This became the basis for mask she eventually designed. When she showed it to Hal, she remembered to say that I had reminded her of the hat". This is the most contemporary source I have for the mask design, and hence the one I'm most inclined to believe. But it doesn't necessarily contradict the others. The latter quote speak of the actual shape of the mask; the meaning behind it could still have been to echo the masks - or the tragedy - of wounded WWI soldiers. Have you heard other explanations on how the mask came to look as it does, and what inspired it? I ordered Melly's fabric samples in silk and they arrived today. She did such a good job with this design! Pictures are below. I'm leaning towards the darker blue or the one that is the largest sample. What do you think? It's so hard to pick. 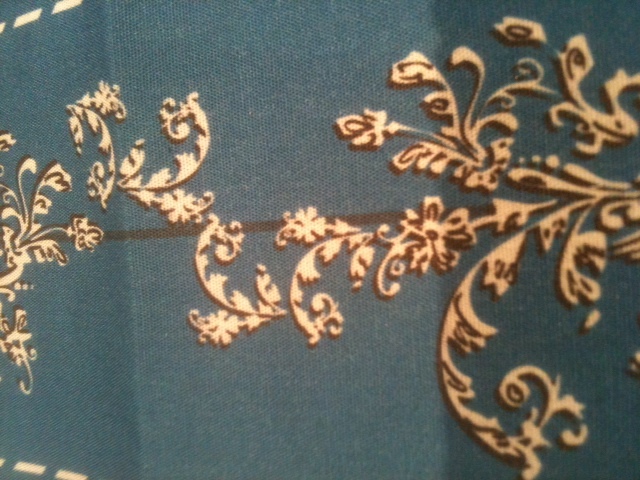 Stephanie wrote: I ordered Melly's fabric samples in silk and they arrived today. She did such a good job with this design! Pictures are below. 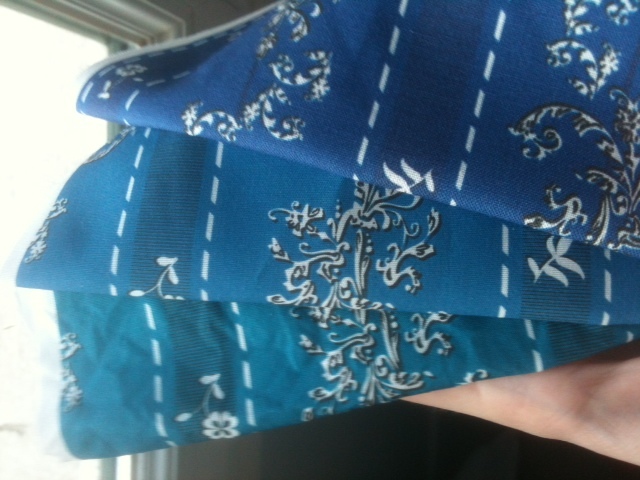 I'm leaning towards the darker blue or the one that is the largest sample. What do you think? It's so hard to pick. You can now order the fabric in the good size. In all seriousness, though, the design looks beautiful. If I had the time and money right now, I'd be all over that. What an excellent job. I simply cannot wait to see your finished gown! Gah! Now even I want to make a Wishing dress! I wouldn't have too much use for it though.. If I was good at dressmaking and had the time I wish I could make a Wishing Dress for an upcoming concert. It would have been awesome as some of my parts are from when Christine is wearing that dress. For those of you making the dress, I look forward to seeing pictures. I seem to recall Crawford saying in his memoirs that Bjornson was the one who came up with the half-mask (and that the biggest problem was making his exposed side look handsome!). The Phantom we know and love was very clearly the result of some intense collaboration between Prince, Bjornson, and Crawford, though--we may never know for certain.